“A story about getting over one’s fear of storms could come across as preachy, but here it is charismatic and approachable…Overall, this is a delightful book.” Click here to read. “I love how Dimity’s passion for words shines through her work. They always warm my heart. Her words are like a gentle hug, wrapped with love to bring joy.” Click here to read. 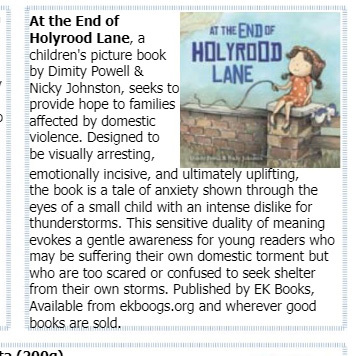 “At the End of Holyrood Lane is recommended by Act for Kids – Preventing and treating child abuse and neglect, and supported by RizeUp Australia, a community- driven organization dedicated to supporting families affected by domestic and family violence. This is a book not to be missed with a confronting theme magnificently executed. It’s a must for every school library and home bookshelf.” Click here to read. 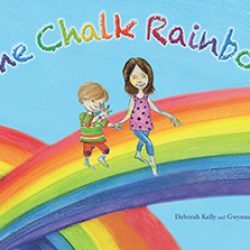 “This is a sensitive book with a message of hope, bringing to the fore a child’s perspective of domestic violence and how it makes the child feel. This book should strike a chord with any child who has experienced any domestic violence and will afford a glimpse of such a situation of anyone who hasn’t. The uplifting ending will give hope to readers that help is at hand and send the message that regardless of how young you are, you can change things.” Click here to read in full. 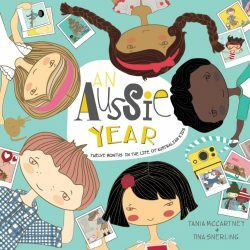 “Few picture books available today address this volatile and woefully prevalent aspect of society without overt explicitness or didactic overtones. At the End of Holyrood Lane does so in a sympathetic, non-threatening way. ” Click here to read in full. “We are so blessed to have such quality writers for children in this country who are unafraid to tackle difficult subjects. This book is endorsed by ActforKids, Paradise Kids, Think Equal and will be launched on 23rd September in Brisbane. I highly recommend it for your young readers from Prep upwards and would suggest that you also bring it to the attention of your school guidance officers/psychologists.” Click here to read in full. “A difficult topic, handled beautifully.” Click here to read in full. “Hopefully this book is starting to change mindsets” Click here to listen. 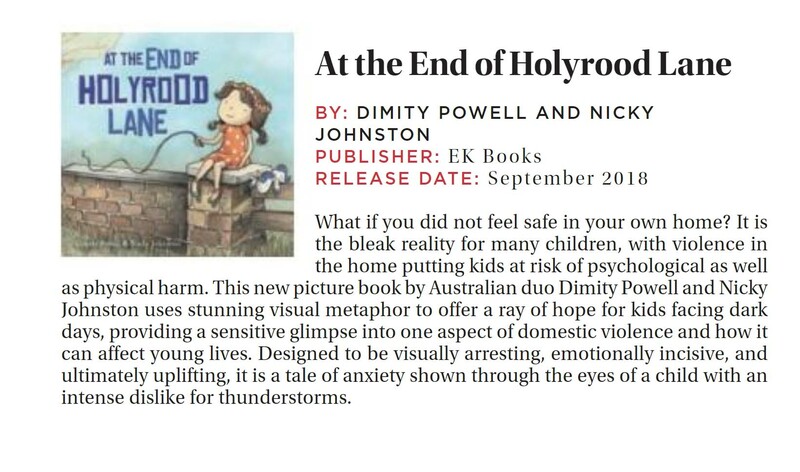 “At the end of Holyrood Lane addresses domestic violence in a very sympathetic and non-threatening way. It is evocatively and beautifully illustrated by Melbourne-based illustrator Nicky Johnston” Click here to read. “Uses stunning visual metaphor to offer a ray of hope to kids facing dark days.” Click here to read. 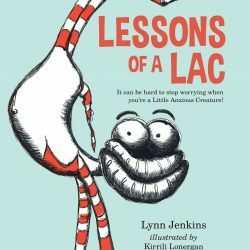 “Endorsed as a resource to help children witnessing domestic violence, this gentle story explores coping with fear in general.” Click here to read. “Designed to be visually arresting, emotionally incisive, and ultimately uplifting, the book is a tale of anxiety shown through the eyes of a small child with an intense dislike for thunderstorms — a fear shared by many young children. This sensitive duality of meaning evokes a gentle awareness for young readers who may be suffering their own domestic torment but who are too scared or confused to seek shelter from their own storms, whatever their nature.” Click here to listen. “If there ever was a story that so finely balances a highly delicate topic with exquisitely gentle language and a resolution that makes your heart swell, it’s At the End of Holyrood Lane.” Click here to read. “Expressive illustrations and text rich with poetic vocabulary share a sensitive story with a message about asking for help when a situation feels scary.” Click here to read. “Domestic violence is a tricky subject to talk about even for adults, but sadly 1 in 4 children are exposed to it. So how do you discuss this topic with young people? 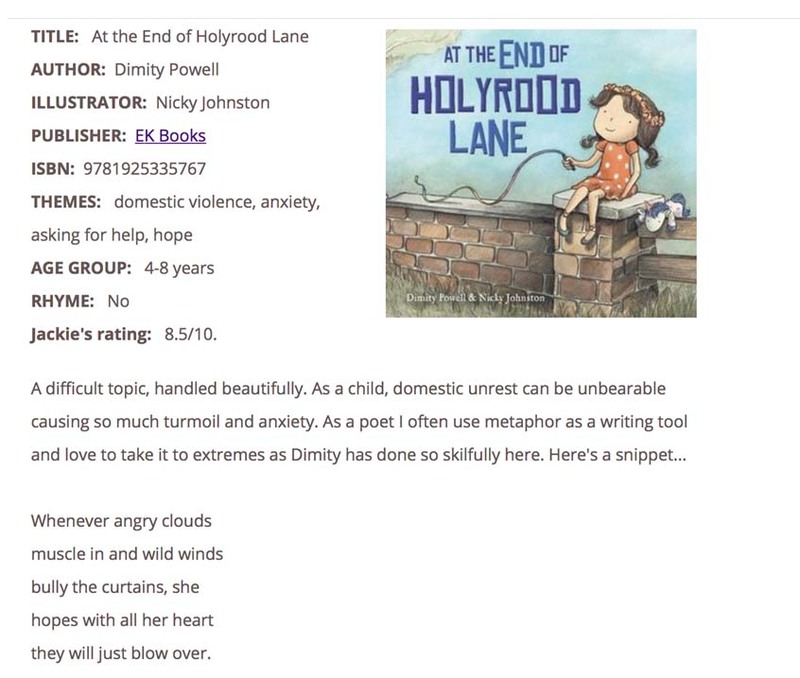 Author Dimity Powell has just a book, At The End of Holyrood Lane, which has been well received by many support services.” Click here to listen. “An important book… facing your fears is the first step to overcoming them” Click here to listen. “…this book with open up discussion with little ones so they feel they can reach out to people when they are frightened” Click here to listen. “Discussing sensitive topics with young children is not easy and it is important to tread with delicate steps. Domestic Violence is a big problem in today’s society and something that concerns entire families including young children. Author Dimity Powell and illustrator Nicky Johnston have come together to create a story that brings hope to those in need.” Click here to read. “At the End of Holyrood Lane provides a sensitive glimpse into one aspect of domestic violence and how it can affect young lives.” Click here to read. “This quietly powerful story is an extended metaphor about domestic violence in a child’s life.” Click here to read. “Storm metaphors as the key to a Gold Cast authors quest to deliver what many think would be impossible, a picture book for young children about domestic violence.” Click here to read. “For some children feeling unsafe in their own home is a sad reality, especially when they are exposed to violence or domestic dispute. Now a new picture book is aiming to tackle the issue using visual metaphor to offer hope and confidence to those feeling in the dark.” Click here to read. “…seeks to provide hope to families affected by outright violence.” Click here to read. “This book uses the storm metaphor to gently reach out to children who are facing their own torments, particularly those children living with domestic and family violence in the home, but also will resonate with children battling their own inner storms.” Click here to read. 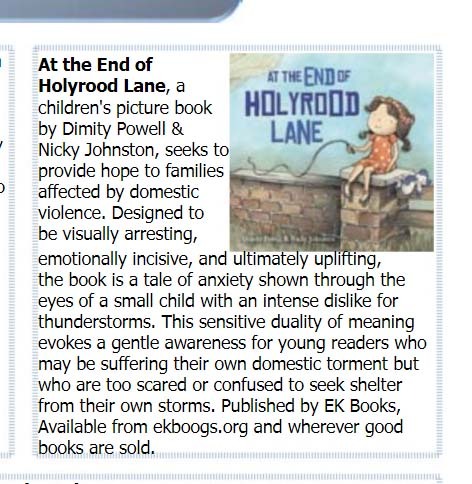 “At the End of Holyrood Lane provides a glimpse into an aspect of domestic violence and how it can affect young lives. The text is very subtle so the underlying story will not be picked up by all children and the storm could be a metaphor for a variety of situations including as simple as being afraid of storms.” Click here to read. “The illustrations show Flick’s fear and joy, the darkness of storms and the glory of a sunny day. If you know someone who is helping children deal with domestic violence, this is the book for them.” Click here to read. “Dimity’s use of nature and its elements as a metaphor for the turmoil caused by violence in a family is beautifully done. The poetic language carries us through Flick’s journey until she finds the ability to reach out for help. What really lifts this book to the next level is Nicky Johnston’s illustrations. The way she hides human forms with the raging storm of nature is just gorgeous. … a brave book”. Click here to listen. 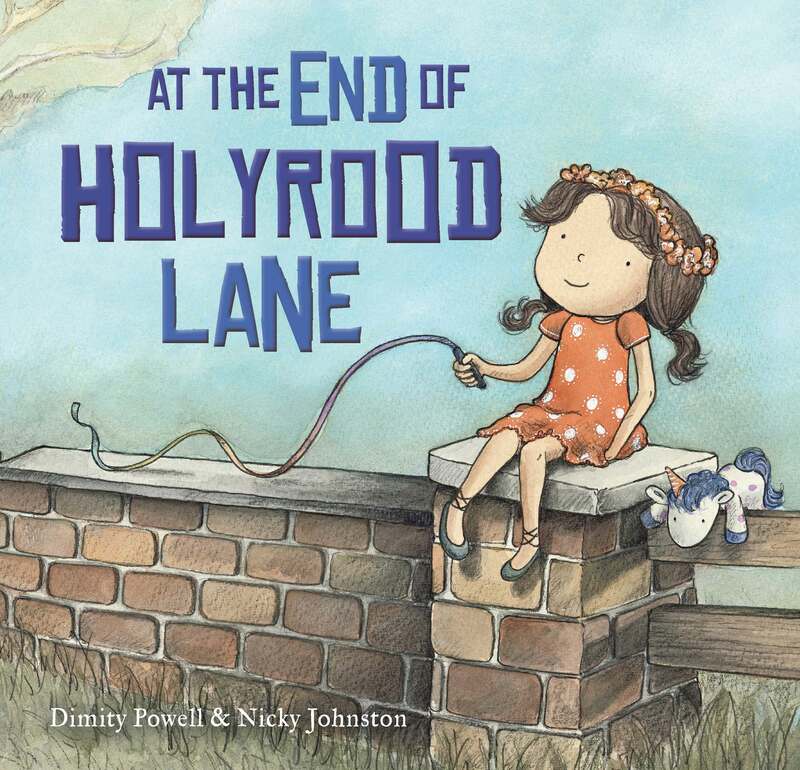 “ At The End of Holyrood Lane is a landmark book on a subject which is a no longer a hidden, tragic aspect life. The skilful use of thunderstorms and stormy skies as metaphors, coupled with simple and yet powerful illustrations makes this a book which should be on the shelves of kindergarten and school libraries and used as an instructive talking time in classrooms.” Click here to read. “Visually arresting…” Click here to read. 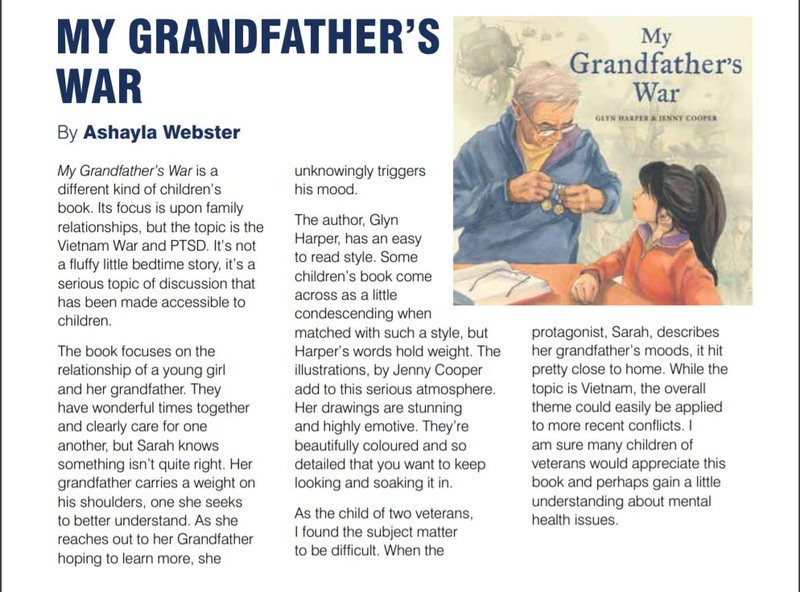 “This is an important book for children, especially those who have experienced the terrible reality of violence in the home. I could imagine this being used by therapists working with children of all ages. It could also be used in the classroom to open up conversation and empower children to seek help when they need it.” Click here to read. “Such a clever, powerful and stunning picture book. The duality of meaning makes it a story about being brave for most children while giving it the potential to speak volumes to those experiencing domestic violence. Encourages children to speak up and seek help whenever they are afraid.” Click here to read. I may be a touch biased, but I love it. An equal joy and wrench to write. Do not be afraid to visit Flick’s fear and see how she overcomes it. Nicky’s tender illustrations will transport your heart to even greater heights. It’s both touching and wrenching that so many prominent Australian charities offering therapy, support, rehoming and psycho-educational services for children and adults alike unreservedly support this book and its intention. Without organisations like: Paradise Kids, Act For Kids, Rize Up and Think Equal to name but a few, sufferers of domestic torment would have even less voice and ability to cope. 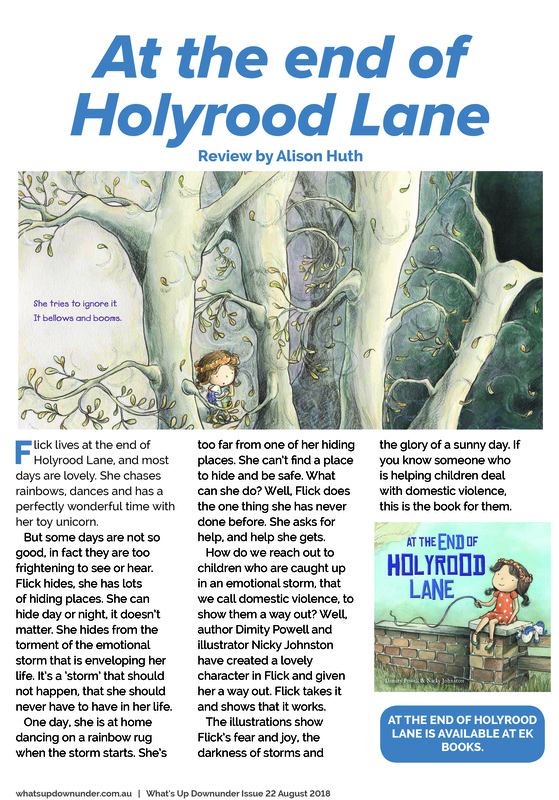 I believe Holyrood Lane’s appeal extends far beyond the subject of domestic violence, as brutally significant as that is because this tale is relevant to any child who experiences anxiety, insecurity and the feeling of being unsafe. 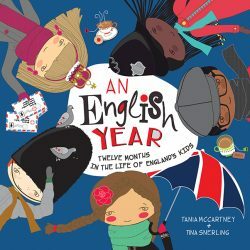 It mirrors a specific situation but also provides a window through which children can catch glimpses of the worlds of others’, thus encouraging understanding and empathy. “the poetry and vivid use of language is exciting and will encourage creativity and love of language in young children. Above all, Dimity’s skills in and focus on mediating social and emotional skills and competencies to children, will encourage them to see help in dark times and help them to navigate through stormy weather and understand that it will pass”. -Leslee Unwin – Think Equal Founder and President. In subtle ways, children’s books have long had a powerful impact in helping generations understand and make sense of the sometimes baffling and frightening aspects of life experienced in growing up. Themes of being lost in a dark forest and finding the way out, of small heroes overcoming big adversities, and of inspiring tales of courage and discovery have all been part of our common cultural legacies. Congratulations to Dimity Powell and Nicky Johnston for creating At the End of Hollyrood Lane, as it is timely in sending a message of hope to a child witnessing the scourge of domestic violence in their family. Only in recent years has the scientific literature turned long overdue attention to the potential long term trauma and adverse effects for little people who survive in homes where family violence is happening. At last attitudes are changing and the tide is starting to turn against family violence. Part of this will change will include children seeking help directly when the adults in their life are unable or unwilling to protect them. The increased awareness of domestic and family violence is already having a powerful effect in which victims and entire communities are now taking action to call it out and end it. The idea of instilling within children a sense of self-empowerment through teaching protective behaviours is also gaining traction. Children’s books such as this have a role to play in the process of helping a child, through metaphor and subtle example, to gain some understanding and in encouraging them to seek help at an early stage. Gary E. Poole is a registered psychologist with 30+ years experience in leadership of child health services in five countries. Since 2015 Gary has served as Southern Queensland Regional Director for Act for Kids, and for ten years prior was CEO of RASNZ, the specialist trauma refugee health agency receiving all UNHCR quota arrivals at the National Refugee Centre at Auckland, From 2004-2006 Gary led the development of child health services and commissioning of hospitals in Badhakshan and Baglan Provinces in Afghanistan in UN funded initiatives.